Sit-down magician and stand up comedian. 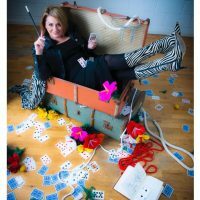 Described as like 'Alison Steadman playing a beauty consultant doing Tommy Cooper-style magic – but without the fez', Mandy would take that as a compliment. With an act made for the digitally-enhanced age, Mandy has audiences astounded with both the brilliance of some (certainly not all) of her magic and in hysterics at her off-the-cuff one-liners and observations. The Crazy Pony Show is a crossover between music, circus and comedy. 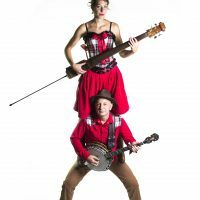 This duet will take you on an intense and entertaining journey; virtuosic banjo picking and a charming bass with sweet harmonies meet acrobatics, contortion and incredible surprises leaving you on the edge of your seat and entranced! Created in 2011, the duo of French-speaking Swiss Léa Rovero and English Frank Powlesland, combine their talents and their love for bluegrass to create this unique "one of a kind" show. The Crazy Pony Show has already performed all over Europe and beyond, winning first prize in two competitions; "Winzerfest in Dottingen (CH)" in 2014 and "Kleinkunst Emmendingen (D)" in 2015. 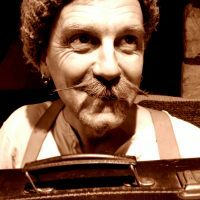 Jonny Fluffypunk is a stand-up poet and economic refugee from the Home Counties who has been dragging his art around the UK scene for over 15 years. A serial slam champion who hates both competition and hypocrisy, he has two collection of writing out from Burning Eye Books and is currently touring his second solo 'lo-fi stand-up spoken word theatre' show. By turns funny, absurd and oddly moving, Jonny's work is both a celebration of the beauty in the mundane and an elaborate cry for help.